HIS Kids is offered during all regular service times. Safety and security is a high priority here. All of our volunteers have a background check on file and have been properly trained and equipped. We have an on-duty police officer during every service to ensure safety for your children. Another way we provide security is by checking your kids in using an electronic check-in system. For children 6 weeks to 5 years old. 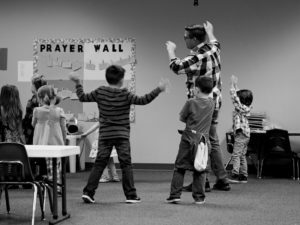 Our amazing department provides age-appropriate activities and Biblical teachings in a way they can understand. We want your kids to know that Jesus loves them and church is fun, so we provide a safe, nurturing, fun environment for them to learn in. For children in kindergarten through the 5th grade. 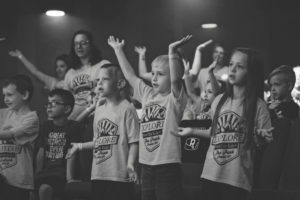 While you’re in service, your children are also learning Biblical truths through high-energy worship, Bible stories and games that will stay with them throughout their life. We provide a clean and safe atmosphere with amazing volunteers who are trained and equipped to teach your children to put God first. For junior high and high school students (6th – 12th grade). Our goal is for your student to feel welcomed in a Christ centered group. His Youth is a place where unity is not only taught, but put into action. There will be plenty of opportunities for your students to connect with Christ followers their own age. Each week your student will learn about Jesus and how to put what they learn into action. They will learn each step to becoming the Kingdom builder God has called them to be.